Montana’s economy is built on its agricultural roots, but there is a strong demand for business professionals and health service providers as well—all promising job markets for the vocational school graduate. 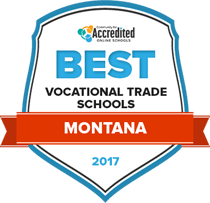 Vocational and trade schools in Montana provide accredited training programs for skilled workers and other non-professional careers, which make up 57 percent of all occupations in Montana. This guide highlights popular vocational programs available at state-approved technical colleges and career centers throughout Montana, career paths for graduates, and resources for those entering the workforce. The following ranking provides a detailed outline of vocational and trade opportunities in Montana. Construction and technical service job sectors are particularly fast-growing and likely to be of interest to students enrolling in one of Montana's career colleges or trade schools. To help you narrow down the options, our rankings are based on criteria that matter most, including tuition rates, financial aid availability, variety of available programs and the like. It takes approximately 62 to 70 credits to graduate with a two year degree vocational degree from Great Falls College Montana State University. An Associate of Science in Nursing, Associate of Applied Science in Web Design and an Industrial Technician Associate of Applied Science in Industrial are examples of vocational degrees offered. Area high school students could earn a two year degree on an accelerated track if they participate in the university's dual enrollment program. Digital tools used at the school include D2L Brightspace, Banner Web, chat and student email. A career coach helps students pick a degree program that fits their work goals. Helena College University of Montana operates on a semester basis. Applications must be submitted by a set deadline. ACT, SAT or Compass exam scores, immunization records and high school transcripts are required from first time students. It takes about two years to complete vocational degree programs in fields like practical nursing, automotive technology, computer aided manufacturing, aviation maintenance and fire and rescue. Even if students take campus courses, they can access MyHC, student email, Moodle and chat support to obtain transcripts, get help from technicians and administrators and check course assignments. Helena College University of Montana partners with six Montana based four-year degree colleges and universities so graduates can finish a Bachelor's degree in two additional years. Fort Peck Community College is a tribal community college that serves Native Americans living on reservations and other adults in the community. Associate of applied science degrees are offered in building trades, early childhood education and automotive, computer and business technology. At least 60 credits are needed to graduate from these vocational degree programs. The majority of courses built into the programs are degree specific. In addition to the degree focused curriculum, core instruction is required to graduate. Relevant core instruction classes include communication, human relations, American Indian Studies and mathematics. In addition to the numerous transfer degrees available at Miles Community College, students may also consider enrolling in one of their vocational associate of applied science programs. By studying in one of these programs, students will receive valuable knowledge that will prepare them to succeed in their field of choice, and ultimately begin their careers immediately after graduation. The faculty employed at Miles Community College have years of teaching experience and on-the-job training, ensuring they will be able to meet the needs of their students. If students aren’t able to complete their coursework through traditional means, they may wish to enroll in online, winter, summer, or evening courses. A variety of degrees are offered at Flathead Valley Community College, all of which will lead to numerous productive and fulfilling careers. Specialized programs are offered for students who are looking to begin working in their field after they complete their associate programs. These courses are taught by professionally trained teachers who have many years of experience in their field. Numerous transfer programs are also available to student looking to continue their learning at a different 4-year school; FVCC holds a wide selection of transfer agreements with partnering institutions, allowing transfer students to enter their new institution with junior status. Students can enroll in accredited vocational and trade schools in Montana to improve employability in key industries driving Montana’s economy: agriculture, business, health sciences, industrial services, and technology. Montana has 485 approved career and technical education (CTE) programs available throughout the state and more than 150 high schools participate in CTE programs to better prepare students for the skilled workforce. Vocational programs are fully supported by the state—the legislature doubled funding for CTE in May 2015 to $2 million to ensure students are aptly prepared for the job market. Health, education, mining, and utilities jobs had the highest levels of employment growth from 2004 to 2013, according to the Montana Department of Labor & Industry. More than 42 percent of jobs in Montana required a minimum of a high school diploma or equivalent in 2015. Montana ranked fifth in the nation for annual wage growth during the 2003 to 2013 period. The state of Montana is committed to developing a more educated workforce and has structured many of its vocational programs to attract individuals who will pursue skilled jobs. Compared to the national average, fewer Montana students opt for a certificate program that can be completed in one year or less. Two-year associate degrees may be more appropriate for those entering the business and healthcare fields and can serve as the foundation for a bachelor’s degree. Education level makes a difference in wages across the state: the average weekly wage for those with an associate’s degree is $534, while the average weekly wage for those with some college is $479. The table below highlights the distribution of undergraduate certificates and degrees in Montana compared to national averages. Montana’s fastest growing industries include the manufacturing sector and high-tech firms, according to the University of Montana Bureau of Business and Economic Research. These companies may have a need for skilled workers to handle factory and plant operations, as well as oversee information technology projects. Montana is also a leader in construction, healthcare, agriculture, and mining. Trade school graduates who complete a certificate or diploma program in any of these skilled trades or service areas can look forward to a wealth of job opportunities in their field throughout the state. The table below lists careers in Montana for applicants with some college and associate degree education with the most job openings. Missoula is home to several career training centers and technical schools that offer programs in areas such as computer training, massage and beauty, and culinary arts. In the surrounding area, there are many schools easily accessible and a short drive away from Missoula employers that hire graduates or students in training. The University of Montana - Missoula College offers several academic programs for students seeking professional and technical careers, including culinary arts, paralegal studies, radiologic technology, and industrial technology, to name a few. Students seeking employment in the city of Missoula can find attractive job opportunities in both the private and public sector. Top employers in the area include the Department of Natural Resources & Conservation, Missoula County Public Schools, Allegiance Benefits, Jim Palmer Trucking, and Western Montana Clinic. Other major cities in Montana, including Billings, Great Falls, and Bozeman are home to major employers of vocational school graduates including hospitals, state organizations, and college campuses. Information about the HealthCARE registered apprenticeship program for aspiring healthcare service providers. Includes available training programs, participating colleges, and resources for students and professionals. Helps aspiring construction and skilled trade workers find jobs throughout the state. Features a comprehensive database of training programs, apprenticeships available, and a job search feature. Up-to-date job listings for open positions available through the state of Montana. Includes online application options and complete details about each position, qualifications, and contact information. Information about CTE programs in Montana and a listing of career pathways with prospect jobs and skills sets. Includes information about National Program Quality Standards and professional organizations. Job seeker and employment services for those looking for state government and non-government jobs. Provided by the Montana Department of Labor and Industry Workforce Services Division.